Ben Taylor is the assistant tennis director at the bloomfield open hunt club. 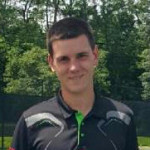 He is USPTA and PTR certified and is a graduate of the professional tennis management program at ferris state university. He has spent time teaching in Shreveport Louisiana and saint claire shores Michigan. After one year with baseline Ben is looking forward to continuing his work with BRC and BOH.